I decided to drop the Munitions in the title as its not germane and its just a case of unpowered missile. "DRDO's Terminal Ballastic Research Lab is working on an airbreathing multi-tube multi-cycle pulse detonation engine. "This pulse detonation engine (with throttling) is expected to generate up to 2.5kN of thrust for a duration of 30 minutes. "Here's and image of the test assembly for the pulse detonation engine which has an operating frequency of 24 Hz." Wonder what is this for exactly..?? LRCM..?? 2.5KN is pretty good effort. How will they test fly it though? US had a 750N engine test-flown in 2008, and nothing since then. Multiple tubes must be to reduce the time between each pulse, sort of like a Gatling gun though without rotating barrels. A decade+ back AWST was reporting on PD test aircraft flying.It even had a pic of a mystery aircraft whose exhaust trails indicated that the engine was most probably a PD one. Mar 8, 2004 STANLEY W. KANDEBO | Aviation Week & Space Technology"
Er wasnt the v1 rocket of ww2 a pulse detonation engine? GD, Correct. It was early form of PDE. PDE are supposed to be for hypersonic craft. I wonder why its the TBRL that is doing the PDE research!!!! Anyway its middle of May and we have no news about the expected Nirbhay test with a turbo jet engine. Please be on the lookout for any NOTAM etc., that herald the test. LINKÖPING, Sweden—Saab’s beastly-looking anti-ship cruise missile, the RBS15, is to be upgraded and installed on Sweden’s new E-series JAS 39 Gripen and Visby-class corvette. The newest Robotsystem15 (RBS) Mark III is already operational as a surface-to-surface weapon for ships and coastal defense batteries, but the Swedish Air Force (SwAF) has not adopted a new air-launched model since the RBS15F in 1982. While today’s C-series Gripen can carry two RBS15Fs per sortie, the Gripen E that will soon make its first flight can carry four. This feat is made possible by a more powerful GE F414-39E engine, additional fuel capacity and reconfigured weapons stations. The Swedish Defense Material Administration awarded Saab a SEK$3.2 billion ($360 million) contract in March for development of the improved anti-ship weapon, tentatively called the extended-range RBS15F (air-launched), RBS15 Mark 3+ (ship-launched) or RBS16. Michael Höglund, Saab’s head of missile systems marketing and sales, says the development program will run from 2017-26, with initial deliveries in the mid-2020s. Meanwhile, the Gripen is about to begin its flight-test campaign with deliveries to the Swedish and Brazilian air forces starting around 2019. Sweden’s first squadron of single-seat E-models will be ready for combat by late 2023, the SwAF says. Today, the turbojet-powered, GPS/INS-aided active radar RBS15 missile is capable of striking ships and fixed land targets beyond 108 nm (200 km) with a crippling 200-kg (440-lb.) explosive warhead. In Sweden, the RBS15 is known as the “Guardian of the Baltic Sea,” with missile launchers set up on the island of Gotland. The weapon is increasingly relevant today given Russia’s military posturing. The Scandinavian nation is technically neutral but maintained close ties with the West throughout the Cold War. Saab and SwAF officials say after decades of relative peace, “an invasion from the East,” meaning by Russia, is once again Sweden’s greatest potential military threat. The military is retooling to meet that challenge. The RBS15 first entered service on Swedish warships in 1979 and it since has been adopted by Germany, Croatia, Finland, Poland, Thailand and one other undisclosed nation. Only Swedish and Thai Gripens carry the air-launched RBS15F. In terms of improvements, Höglund says the basic heavyweight design and benefits of the Mark III version will remain, but the missile is to be modified for greater range, probability of kill, electronic protection, survivability, and all-weather capability. It already has guidance. It will have random terminal phase maneuvering for survivability against air defense weaponry. Along with greater range, the future weapon’s autonomous flight control software will be updated for greater reliability and target discrimination at longer ranges in cluttered maritime scenarios. It will have improved land-attack capability and provisions for a datalink, even though the Swedish military does not see an immediate need for inflight networking. Asked about the RBS15’s draggy, fat-looking design, which is uncharacteristic of a Saab product, the manufacturer said there are no plans to change the shape. “This design does the job,” Höglund explains. Doubling the missile loadout on the Gripen from two to four will greatly increase the strike potential of a combat packet. The Gripen E also will have a “game-changing” loadout of air-to-air missiles, carrying seven ramjet-powered MBDA Meteor missiles instead of four. The missile became operational last year. Maj. Johan Jeppsson, SwAF’s director of Gripen operational test and evaluation, says maximum RBS15 and Meteor loadouts would be perfect for certain major wartime operations. Höglund sees great export potential for the surface-launched RBS15 Mark 3 and the future air-launched version, although not in the U.S. “We’re [not actively] pursuing the U.S. market,” Höglund said when asked about potential opportunities like the U.S. Navy’s Over-The-Horizon Weapon System program to arm the Littoral Combat Ship. The RBS15 cannot be carried inside the internal weapons bay of the Lockheed Martin F-35 Lightning II, but could be carried on its wings. Its main rivals include Norway’s Kongsberg Naval Strike Missile and the smaller, F-35-carried derivative marketed by Raytheon, the Joint Strike Missile. Others sales opponents are the Boeing Harpoon and Roketsan Standoff Missile, but not the Lockheed Long-Range Anti-Ship Missile, which enters service over the next two years on the Boeing B-1B and F/A-18 Super Hornet, because it has not been cleared for export. The RBS15 Mark 3 will undergo continual product improvement while the future derivative goes through development. Brazil has not yet signaled if it will adopt the RBS15 for its Gripen E.
The facility looks even more SDRE than any Indian facility. ramana wrote: I wonder why its the TBRL that is doing the PDE research!!!! My guess is they are the ones with the right equipment (really fast photography) to look at the detonation waves propagation, something that can not be modeled easily, for the PDE. Ideally I would expect the PDE project to be run by ASL, Hyderabad using all the national labs for test facilities, resources, talents etc. Image of yesterday's MRSAM test from Kochi. IIRC, INS Chennai is yet to do a MRSAM test. @2:10 onwards,are the wierd looking bogies IRBM/ICBM TEL coaches? Last edited by ramana on 20 May 2017 12:32, edited 2 times in total. 8 rakes, 3-4 different designs. Someone please contact the poster of this video at kashyapujjawal@gmail.com to ask him to delete the last part of this video. Last edited by ramana on 20 May 2017 12:31, edited 1 time in total. Whoever posted that video is a total idiot. Kashyap the poster posts videos of trains in the Bhopal area predominantly. Bina-Bhopal third line, Bhopal -Itarsi etc. That is all he does. Next that area is mostly electrified. But we see diesel running under wires. That does not leave too many lines in the Bhopal area to which this train is heading or coming from. It is also possible to guess the station name from some of the videos. Asking the poster to remove that video is useless, the damage is done. the theory of 1-dimensional detonation shocks is now almost standard. The basic articles are by three people, Zeldovitch who was very involved in the Roosi H-bomb but then along with Sergei Novikov turned his attention to Cosmology and Black holes in later life. The three papers appeared almost at the same time. This is enough to do a full analysis of the 1-dim shock. When the dimension gets more, there are more unknowns lets say and having 3 bits of information is not enough. Its like solving 8 unknowns with 3 equations. So TBRL takes "fotu" use model and this and that. For example in the wiki link above, what is the analog of the Lax-Oleinik condition [ eqn. (11) in wiki link] for a 2D shock. Does anybody know? All of this is valid in some form for jet engines etc. Okay back to lurk mode. One more food for thought: The pics people have posted are devices with "long thin tubes". It seems they are trying to replicate a 1-dim shock for which there is a mathematically solid theory. Last edited by vsunder on 20 May 2017 08:26, edited 1 time in total. Hope this Kashyap or whoever posted that video is arrested and made to face the music for this. Preferably, he should rot in some prison for several years undergoing third degree treatment regularly. Such compromises of security cannot be allowed. How is the govt. to make out whether the posting of that video is out of stupidity or a deliberate act on some external agency's behalf? Either way this compromises a portion of our national deterrent. The culprit should pay for this. The guy who posted did most damage. Innocently or not he has compromised a portion of the deterrent. Must face consequences for this that deter others from this type of thing: people must know that when they see something exotic with the armed forces, they are not supposed to videotape it - publicizing such a video is far worse. Unless it is authorized by GoI itself for signalling something to our adversaries, such things should never be out in the open. ``Done under GoI authorization" is the only circumstance under which the poster should not be arrested. Hakim Saheb, these don't look like "just" missile carrying rakes. With more and more camera phones around, it's going to be very difficult to restrain such shootings and postings. Whether they are from Babina or otherwise. I am unable to understand the total lack of effort in trying to camouflage. How difficult can be putting inactive doors, fake pasted black windows, hiding sheet metal widths etc. Removing links from brf is least we can do. Why camouflage them at all. There is nothing to camouflage in an empty rake that is what - 100 feet long? let them go around the country and invite people to keep on videoing them. Nothing will happen. An empty rake means nothing and it is good to let people follow them all over on false leads. ramdas wrote: The guy who posted did most damage. Innocently or not he has compromised a portion of the deterrent. Must face consequences for this that deter others from this type of thing: people must know that when they see something exotic with the armed forces, they are not supposed to videotape it - publicizing such a video is far worse. Unless it is authorized by GoI itself for signalling something to our adversaries, such things should never be out in the open. ``Done under GoI authorization" is the only circumstance under which the poster should not be arrested. If a Hurriyat member or son of Bollywood director like Mahesh Bhatt does these videos and gives them in private to Pakis - you are saying that that would be "less damage" than this video? I am not convinced that this is right. It is not illegal to take videos of trains. If something must be hidden it must either be completely hidden or hidden in plain sight. Indians are not so dumb as to be unable to hide stuff they want hidden. Dont worry. What was in the video is known by most. DRDO/MoD have pasted pictures of these before.Just don't discuss the video anymore, and everything will be fine. ^^Ok folks this is that whatits name cruise mijjile that failed. It will work this time. I tell ya..
shiv wrote: ^^Ok folks this is that whatits name cruise mijjile that failed. It will work this time. I tell ya.. Thanks Kurup With that dogleg, Nirbhay it is. Is this Mijjile a three legged cheetah ya two legged hawk? IAI press release announces further LRSAM Contract. This one covering 4 naval vessels and valued at USD 630 Million. Any idea what class of vessels this order is for? 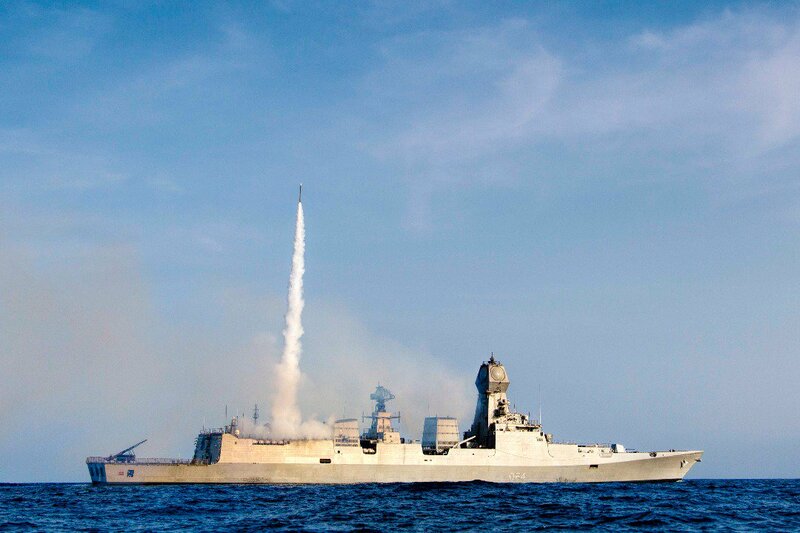 Israel Aerospace Industries (IAI) announced today it has been awarded an additional, $630 million- contract for supply of LRSAM air & missile defense systems for four ships of the Indian navy. The contract will be carried out, for the first time, with Indian government company BHARAT ELECTRONICS LIMITED )BEL), which serves as the main contractor in the project as part of India's "Make in India" policy. Prior to signing the contract, the System was successfully tested last week in India as part of operational interception trial aboard India's navy ship, demonstrating again the System's operational capabilities in a representative scenario with genuine target. The trial scenario started with the launch and engagement of the target. The MFSTAR radar aboard the Indian naval ship has identified the air-borne threat and has tracked it over its flying course. The data was sent to the command center of the weapon system which launched the intercepting missile into orbit. Having been successfully launched, the missile has navigated itself to the target. During its flight, it engaged the target, aligned its course, hit it and destroyed it. All components of the weapon system have successfully met the goals set to them. Joseph Weiss, IAI president and CEO, said, "The new contract adds to other deals signed in the last decade by IAI with India's defense forces, reinforcing IAI's global leadership position in air and missile defense systems. The inclusion of Indian governmental company BEL for the first time, is a step up in our relationship with the Indian industry as part of the 'Make in India' policy. This unique project represents the close collaboration between India's DRDO, IAI and the defence forces of both countries. We will proceed to implementing it with joint efforts." Boaz Levi, Executive Vice President and General Manager of Systems, Missiles & Space Group said: "We take pride, along with our partners in India, in the great results of the trail conducted last week, which reestablishes the System's reliability and quality as well as its advanced technological capabilities. IAI is in an accelerated process to supply the various air and missile defense systems to the client. We will continue to support our partners in India in advancing the industry and security of both countries." LRSAM is an advanced air and missile defense system, a unique joint development by IAI and India's Defense Research and Development Organization (DRDO) in collaboration with IAI subsidiary ELTA, RAFAEL, various Indian companies including BEL, L&T, BDL and other private Indian companies. The system comprises several key state-of-the-art elements, advanced phased-array radar (MFSTAR), command and control system, launchers and missiles with advanced RF seekers. The system provides the ultimate protection against a variety of aerial, naval and air born threats and is operational with the Indian Air Force, Indian Navy and Israel Defense Forces and in the near future with Indian Army. The navarea for the May 25/26 test is no longer there. The rate of missile testing is just as in UPA days: no improvement. When NoKo and PRC are indulging in rapid testing, and even TSP is obtaining a MIRVed system, a proportionate escalation in the pace of missile testing should have happened on our side as well. This should have included a green signal for MIRV testing as well. Maybe, having a DRDO chief who is not from the Missiles and Strategic Systems cluster is having a detrimental effect on the priority attached to these programs. ^^^ maybe it might be because of some glitches they found and dont want another public outpouring like after the last Nirbhay test and would rather be 100% sure? In comparison to the Agni-III and Agni-IV, the Agni-II had a relatively trouble-free development flight process. On April 11, 1999, the Agni-II was tested to a range of 2,300 km with a 1,000 kg payload. This established a pattern for Indian missiles – production and user trials would follow three consecutive successful technical trials. The 1999 test was followed by one on January 17, 2001 and another on August 29, 2004. Production of the Agni-II followed thereafter. But it was not until 2009 that user trials began, the first two of which were complete failures due to quality control problems during manufacture. However, on May 17, 2010, the first user trial from a production batch was completed followed by similar production batch trials undertaken by the SFC on September 30, 2011, August 9, 2012, April 7, 2013 and November 9, 2014. This means that the Agni-II has become the backbone of India’s IRBM force. The inevitable question that arises is whether the Agni-II was rushed into production after only three technical flights. It is submitted that this is not necessarily the case. Depending on the type of missile, technical trials are meant to establish the performance parameters of the system. Once this has been established, there is no reason why production cannot commence provided that tests from production batches are conducted to confirm performance. The development of computer simulation also helps reduce the number of dynamic technical trials which are inevitably expensive to conduct. The Russian Federation has followed this development path, with its RS-24 and RS-26 ICBMs being placed into production after two to three successful developmental flights with the RT-2PM2 ICBM being placed on experimental combat duty after only a single test. In the Indian context, where the production run of the Agni-II has not exceeded 36 to date, the luxury of conducting 10 or more technical trials is impractical Moreover, given DRDO's very limited production facilities, obtaining sufficient missiles for more than 10 technical trials requires putting the missile into production..
What is the pedigree of that test vehicle? Of the 36 missiles what was its number? And do they mix and match the stages or keep the age aligned? Also what is the storability of the propellant? I recall this 4 May 2017 test was aborted around 200 secs? First stage flight is around 65 secs. So what's going on? Or anamoly started early during First Stage ? Also more development trials won't reveal age related or latent defects. So people demanding more trials are not correct. There flight tests per payload type accompanied by motor ground tests should have adequate confidence. Early Agni II tests were actuator quality issues. So the writer is pointing out differences. What is being is this should be classified and some SFC with DRDO should speak and not let 'informed ' speculation drive the narrative.